Noropraz Equine Paste is indicated for the treatment of mixed cestode and nematode or arthropod infestations, due to adult and immature roundworms, lungworms, bots and tapeworms in horses. Noropraz wormer combines two highly effective ingredients and contains the same active ingredients as Equimax. Noropraz wormer will kill all major internal parasites in the horse. 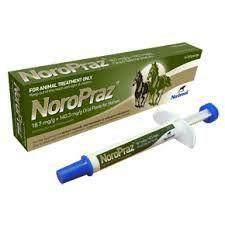 Noropraz wormer is supplied in the adjustable multidose syringe. A single Noropraz syringe delivers sufficient paste to treat 700kg bodyweight at the recommended dose rate.